There’s always a “story” in Newport. The Parterre Bench has a magical one stretching back over 30 years. While pheasant shooting in Ireland at Birr Castle, I chanced upon an intriguing piece of furniture. The Earle of Ross had a garden bench whose design looked like something straight from Alice in Wonderland; the swooping R’s with tails resembled the devil’s pitchfork. Intrigued, its image stayed with me. When designing my Newport garden in 1999, I specifically created a bower in our winter garden that can be seen from the main rooms in our house. It came with the promise to myself that I would someday re­create this bench whose memory I had been carrying for so long. And so, to celebrate the publication of my first coffee table book, Private Newport: At Home and in the Garden, I designed this personal take on an iconic garden accessory. 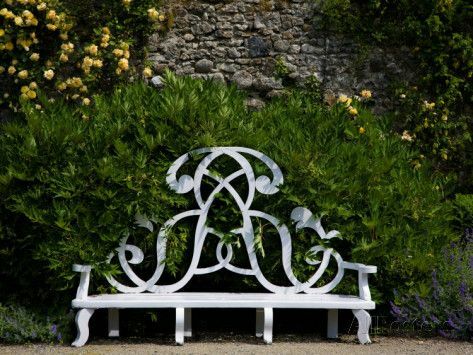 Beautifully­-scaled, the Parterre Bench measures a generous 62 inches wide and rises to a dramatic 5’3”. Hand constructed of Honduran mahogany (a high ­quality hardwood very suitable for paint), the bench can bear the demands of even the liveliest garden party. I’m so very proud to present the Parterre Bench, now available to share a spot in your garden. A bespoke piece of furniture made to exacting standards by a 4th generation Newport, Rhode Island craftsman and finished in your choice of color, this creation is the perfect gift for oneself… to celebrate a birthday or anniversary, dress up the garden for a special celebration, or perhaps to give to a bride. A special order, the bench is usually ready for delivery within 8­-10 weeks and is a timeless treasure to be enjoyed for years to come.